The fast-casual restaurant specializes in fried chicken sandwiches, but the homemade ice cream taco is even better. At The Bird, the chicken is free-range, the slaw is made in-house, and the buns are baked daily. When I heard that the San Francisco fast-casual restaurant The Bird was opening a new outpost in the East Bay, I had to try it. Granted, the hype around this restaurant was a little off-putting, especially because it only serves about five dishes. That being said, specializing in something as simple as fried chicken is pretty bold. The restaurant is on the corner of Telegraph Ave. and Channing Way, where The Melt — the grilled cheese joint that now seems to be focusing on burgers — used to be. It's the second outpost of The Bird, which is part of the Bay Area restaurant group BACK OF THE HOUSE, whose other ventures include Delarosa, Beretta, Uno Dos Tacos, and Super Duper. The Bird is similar to Super Duper in that both restaurants focus on inexpensive food — primarily focusing on one dish — that is both filling and thoughtfully sourced. In Super Duper's case, it's the cheeseburger, while The Bird focuses on the fried chicken sandwich. As with other BACK OF THE HOUSE restaurants, The Bird prides itself on its farm-to-table approach. That means free-range chicken, buns baked in-house daily, and a house-made slaw. 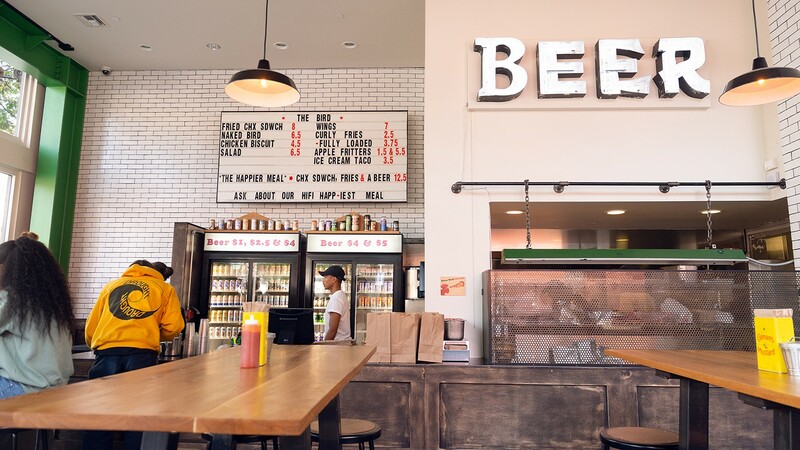 While the farm-to-table concept is hardly new in the Bay Area, it's a relatively recent introduction to the fast-casual model, and even more unusual to find it in a fast-casual restaurant serving "fast food." Roy Choi and Daniel Patterson espoused similar ideals with Locol, which recently closed, but BACK OF THE HOUSE ventures have thus far been more successful. At the Berkeley location of The Bird, the menu — posted on the back wall — is written on one of those giant cinema marquees, which seems to be very popular these days. For lunch, there are only a few entree options with your choice of "spicy" or "regular" chicken: the signature chicken sandwich, the "naked bird," or the bird salad. Both the chicken sandwich and the "naked bird" are composed of mainly the same ingredients, except that the latter does not have a bun. Stacked high on the sandwich is a large portion of chicken, an apple cabbage coleslaw, celery, and dill pickles. With the "naked bird," the coleslaw is served on the side — far less than the amount you get on the sandwich. The chicken itself is a large, juicy piece of dark meat big enough to be satisfying on its own. Both the spicy and regular chicken are seasoned with a berbere spice mix — an Ethiopian blend that includes paprika, garlic, fenugreek, and other spices. It's aromatic, similar to Chinese five spice but with a salty bite like Old Bay. Even if you're a spice freak, avoid the "spicy" version — particularly if you're ordering the sandwich. While the chicken itself had good flavor, the sauce was very greasy. It was reminiscent of Nashville-style hot chicken, which has a blend of spices usually mixed with the frying oil. The benefit to that is the chicken stays crispy rather than soaking up too much of the sauce. But in this case, because of the piping-hot oil and the temperature of the chicken, the fresh bun stood no chance and immediately soaked up the sauce and broke apart within two bites. Another reason to avoid the spicy version is that it completely overpowers the coleslaw on the sandwich. Yet even on its own, the slaw lacked flavor. While the apples were crisp, they lacked sweetness, thus making them almost indistinguishable from the cabbage. The celery and pickles, on the other hand, provided a fresh and bright contrast to the spiciness of the chicken. You can also get your chicken on a biscuit, an option that is only available for breakfast in San Francisco. This time I tried the "regular" style of chicken, and it was great. The biscuit, although tiny compared to the chicken, was flaky and buttery without being overly salty. For only $4.50, this is definitely worth getting if you're looking for a smaller option than the full sandwich. Another smaller option is the hot wings, which come three to an order with a side of dipping sauce for $7. Or you can order à la carte for $2.50 a wing, which is pretty steep, but The Bird appears to be banking on its consumers preferring quality over quantity. The only possible vegetarian entrée is the salad, which has a mix of romaine lettuce and kale with braised beets, apples, spelt, and celery with your choice of dressing: ranch, blue cheese, or a vinaigrette made with honey and champagne vinegar. You can also top it off with a full or half order of chicken for a more filling meal. 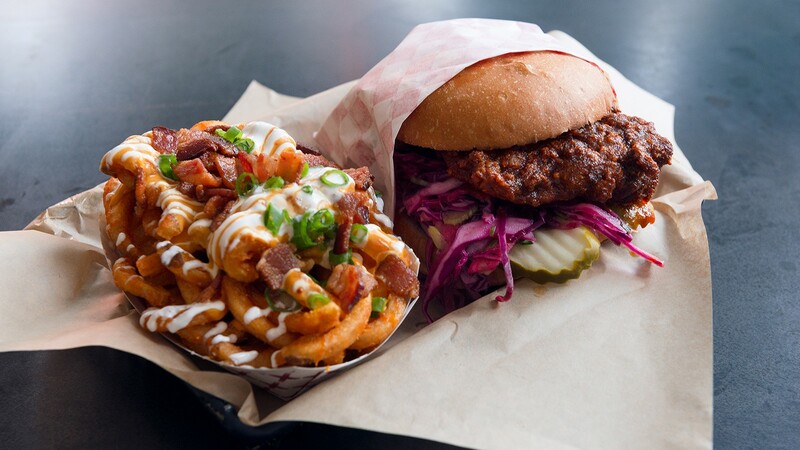 As for sides, you're fairly limited in offerings: either regular or "loaded" curly fries. The "loaded" version is covered in sour cream, bacon, green onions, and cheese. When I asked the cashier whether it was a cheese sauce or melted cheese, she assured me that it was melted cheese. While there may have been melted cheese in it, it was definitely more of a cheese sauce — thick and smooth like nacho cheese without the elasticity of normal melted cheese. I could've done without it. The cheese sauce combined with the sour cream drenched the fries and quickly turned them soggy. They would have been better with just one of those options, especially because the bacon was very good. The slight spice of the green onions added a refreshing element, and I wished there had been more of them to help cut all of the fattiness of the other toppings. One of the best parts of the meal — and an exclusive to the Berkeley location — was the homemade ice cream taco. If you grew up eating Choco Tacos, this will only fuel your love for the iconic dessert. A Choco Taco consists of a waffle cone in the shape of a taco shell filled with vanilla ice cream and dipped in chocolate and peanuts. The Bird's take is virtually the same but everything is made in-house and you have a choice of peanuts or crushed pretzels as the topping. At the Berkeley location of The Bird, the menu — posted on the back wall — is written on one of those giant cinema marquees, which seems to be very popular these days. The Bird plans to add more items to its menu in the coming weeks, including breakfast items like an egg and cheese biscuit with sausage or bacon. It's no doubt that The Bird has found a great location to appeal to students and tourists. But the north end of Telegraph Avenue, perhaps more so than other places in Berkeley, has a high turnover rate when it comes to restaurants. Only time will tell if The Bird will be able to set itself apart or get lost on Telegraph Avenue. There's also the fact that there are already established restaurants in the East Bay serving fried chicken sandwiches, so The Bird will have to compete with the likes of Hopscotch, Proposition Chicken, Bakesale Betty, and Hawking Bird. While The Bird's sandwich isn't a game-changer, it is cheaper than many of those options. And that in itself makes it a worthy addition to the fried chicken scene. Hours: Daily 11:30 a.m.-8 p.m.